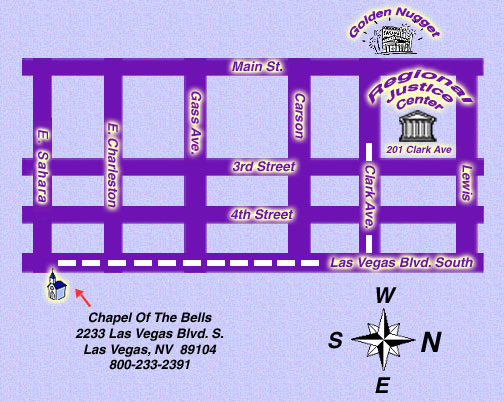 Chapel of the Bells provides a hassle free license service with packages that include transportation. However, if your package does not include transportation, the following information will assist you in obtaining your own marriage license to be married in a Las Vegas wedding chapel.. There is no blood test or waiting period in Nevada. You must obtain your license from the Regional Justice Center at 201 Clark Ave. Both parties must appear in person with proof of identity. The fee is $77.00. Licenses are issued immediately. You may obtain a license up to one year prior to wedding. For both male and female, age 18, proof of age is required. Persons between the ages of 16 and 18 may be married with the consent of a parent or guardian. Proof of age is necessary and proof of identity of person or persons giving consent. A legal guardian must provide proof of appointment by the court. If a parent or guardian is not present, a notarized affidavit stating name, age, place of birth and relationship of person(s) giving consent. For persons under the age of 16, a Nevada Court Order must be obtained. Only one form of picture I.D is required. Divorce papers are not required for a remarriage in Nevada. You will be required to sign on your license application that you are legally divorced. A divorce granted in another state must be final in the state in which it was granted. Hours: Everyday 8am until midnight. License Fee: $77.00 License issued immediately.